Synopsis: Henry Shackleford is a young slave living in the Kansas Territory in 1857, when the region is a battleground between anti- and pro-slavery forces. When John Brown, the legendary abolitionist, arrives in the area, an argument between Brown and Henry’s master quickly turns violent. Henry is forced to leave town—with Brown, who believes he’s a girl. Review: I LOVE James McBride. He has a tendency to see things that others don't and bring them to our attention. I really enjoyed Song Yet Unsung a few years back. I would say it's my favorite from him so far. He has a good grasp on historical fiction, as witnessed in Song and Miracle at St. Anna. 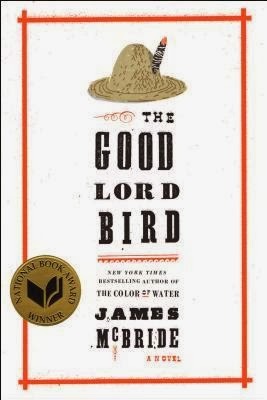 After it won the National Book Award, I knew I had to give The Good Lord Bird a read. It should be noted that while the book is based in history, it is mostly satirical. While at first I found that amusing, it grew old and stale quickly. A boy pretending to be a girl, living in the wilderness with John Brown and his group of men, can be a sticky situation. It's an even stickier situation when the boy is a bit dense and doesn't always make the most logical decisions. The book tended to drag on in parts and by the time I made it to the end, I just wanted McBride to bring on the raid and wrap up the story. It reminded me of a joke that's gone on entirely too long, but no one wants to tell the comedian so they continue to listen in hopes that it'll be over soon. Make no mistake, McBride is a great storyteller, this story just wasn't enough to really interest me. Much more entertaining was an appearance by McBride and the Good Lord Bird Band at the New York Public Library last month. In between McBride reading excerpts from the book, the band (of which he is a part) sang and played songs that fit the book scenes. It was simply amazing. I watched the live stream on YouTube and have included a part of it below for your enjoyment.